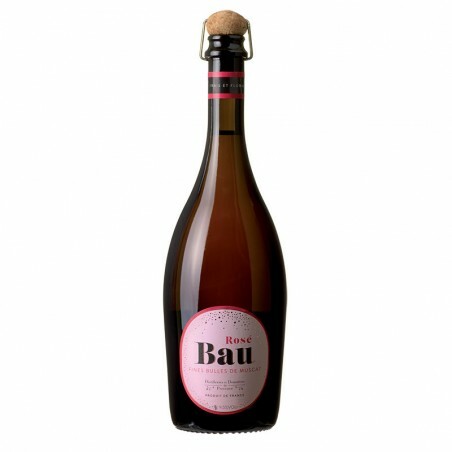 With its fine stream of pure Muscat bubbles, Bau boasts an inimitable fruity and natural flavour (its fizz is produced by natural fermentation). Bau is the ideal companion for every occasion: fresh, generous and festive with a light, lively and fruity palate! You won’t resist its delicious and generous bubbles. In Provence, Bau is the ideal sparkling wine to serve on Twelfth Night with the traditional frangipane! Bau is available in two versions: white or rosé and is best served well chilled as an aperitif or with dessert. Or why not in a cocktail? Bau is a sparkling wine developed with Muscat d’Alexandrie grape (from Luberon), a white vine growing on a hilly area. Its delicacy and its sensual delight will be appreciated on any festive occasion, to be served very fresh ! Bau Rosé is a naturally sparkling wine exclusively elaborated with Muscat de Hambourg grape musts from Vaucluse, a black vine which gives its elegant pink and glossy robe. In Provence, we appreciate its fresh, fruity taste. It is a very refreshing, naturally sparkling muscat wine. Different from common sparkling wine and champagne, Bau is produced from white muscat “petits grains” grape musts, transformed to bubble wine using a unique and natural fermentation process that turns the sugar to alcohol and bubbles. This bottle contains all the finesse and elegance of the fruity scents of Muscat de Hambourg. the sugar to alcohol and bubbles. According to Provençal tradition, it was "King René" who introduced the Muscat grape into our vineyards (which is why you'll find a statue of the king, grapes in hand, looking down over the Cours Mirabeau in Aix-en-Provence.). Although there is no disputing that he loved this grape, the truth is that it had already been in the region at least a century beforehand. In Forcalquier, it was grown in the early 17th century. This sparkling wine is made from the must (grape juice) of the Muscat grape. Fermentation takes place in a closed tank at a controlled temperature (18ºC to 20°C). It lasts on average one month. When fermentation is stopped by chilling, there remains approximately 38g/l of sugar in the Bau. The carbon dioxide is a natural product of the fermentation and retained in the product until it is bottled. It is important to note that this is a low-alcohol wine with a pressure of around 2.5 bars, which undergoes only one fermentation. Its unique taste is very similar to the taste of a Muscat grape. Bau Rosé is made from the must (grape juice) of the Black Hamburg variety cultured with carefully selected Saccharomyces Bayanus yeasts. Fermentation takes place in a closed tank at a controlled temperature (18ºC to 23°C): There are several methods for making sparkling wine. They all culminate in what is traditionally known as "secondary fermentation," the final stage of winemaking that gives the wine its effervescence. For Bau Rosé, the second fermentation does not take place in the bottle, but in a pressurized tank. Fermentation is stopped by chilling once it reaches a strength of 9.5%/volume and there remains approx 38 g/l of sugar in the Bau Rosé. The carbon dioxide present is a natural product of the fermentation and retained in the product until it is bottled. The final pressure of the wine is around 4.5 bars. to desserts and cakes, Bau sparkles for special occasions, it shows us how to entertain with elegance and good taste: on light desserts (tarts, fruit mousses, crêpes, galettes des rois, etc.). As an aperitif, it can be served neat or mixed with Amandine for an original and delicate aperitif: Lou Parpaillou. Appearance: Bau has a light, rather golden yellow color with fine, light bubbles. Bouquet: A definite Muscat aroma with floral notes of rose and jasmine, enhanced by a tiny touch of citrus and exotic fruits. Palate: Bau can best be described as a very light, easy to drink wine with good length on the palate from the Muscat grape. The characteristic highly aromatic, rather fruity flavor of the Muscat grape unveils very unusual jasmine floral notes. To round off this unique aromatic bouquet, there is honey and an occasional hint of bergamot. Before opening, store at room temperature (10°/20°C) away from light. Once opened, drink immediately or can be kept for a few hours with a special sparkling wine stopper. Drink very cold, between 8ºC and 10°C, or even over crushed ice. to desserts with chocolate or Red berries. It marries well with certain fruit juices in a cocktail and is delicious poured over crushed ice to accompany a blackcurrant or mandarin sorbet. Appearance: It has a bright pinkish color with orange hues and fine, light bubbles. Bouquet: It is fresh on the nose with the characteristic red fruit notes of the Black Hamburg grape and added complexity from more floral notes. Palate: It is lively in the mouth with fruity Muscat aromas and a sweet taste.